The whole planet is in front of danger of no-sustainability for all mankind. By chance, now in this crucial moment, are offered new techniques of an enormous potential: biological techniques and digital techniques. And even fusion of both, in something that can be named biodigital architecture. One that has incorporated the advantages proportioned by the understanding of genetics in both ways, the biological and the digital way, that permit to face with hope some continuity also worthy, but this time a dignity for all The Earth. Then, as the ones that made efforts to break with the ancient classical tradition to found the new modern tradition, we are in front of the challenge of creating the future tradition of biodigital and genetics. For this is necessary that people work on three key elements: research, teaching and profession. 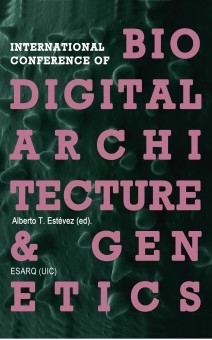 This is exactly what we have been doing in Barcelona from 2000, with the Genetic Architecture Research Group and Ph.D. Programme, with the Biodigital Architecture Masters Degree and with the Genetic Architectures Office. There we learn & teach, we make research and we design: Knowing that there are sufficient differential parameters to predict a complete ages change. Today, after the first decade of our new Century, it is time to explain, to check, to discuss, fascinations, inspirations, experiences, that the graduates of these Research Group, Masters Degree and Architecture Office have done in the developing of this biodigital architecture and genetics, up to now.